British designer/makers Splinter Works will be exhibiting their limited edition Stiletto Desk at the Decorex show in London next week. 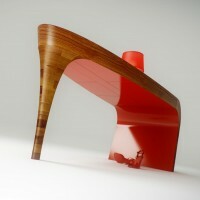 Stiletto can be appropriated for all manner of functions; desk, console table or dressing table. 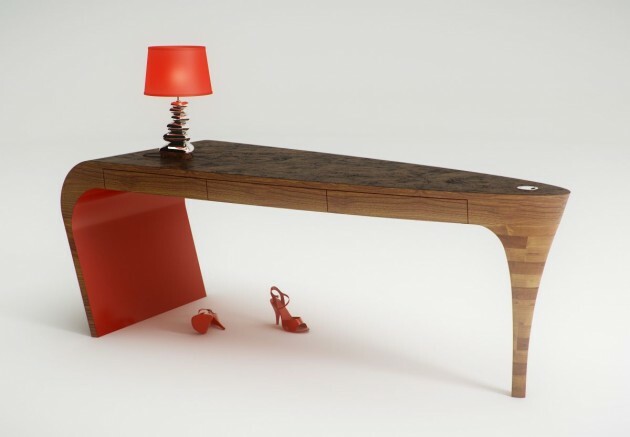 The sinous leg of the table evokes a ‘stacked heel’ stiletto, and is hand sculpted from solid stacked walnut. 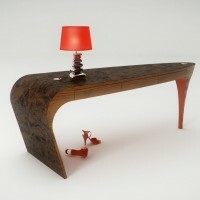 The iconic ‘red sole’, defines the underside of the table in polished red acrylic, with a French Burr Walnut veneer curved top (as seen here) or with inlaid leather (offering a modern twist on a leather topped writing desk). The drawers are perfectly fitted to glide open without runners, and they have no handles; just a neat hidden finger groove on the underside ensures the seamless hidden functionality of the clean sculptural shape. The drawers are lined in red nubuck leather. Optional cable management can be installed with a conduit for cables to run through the stiletto leg. Custom sizes and finishes available to order. Visit the Splinter Works website – here.